Raleigh of Nottingham was for many decades the worlds leading manufacturer of bicycles. Here are some of the high points of a more than a century of bicycle manufacture. 1886 Three Englishmen - Woodhead, Angois and Ellis - begin building bicycles in a small workshop on Raleigh Street, Nottingham. 1887 Alfred Milward Reynolds invents the process of butting (of tubes). 1888 Frank Bowden purchases the Woodhead/Angois/Ellis bicycle workshop on Raleigh Street and renames it the Raleigh Cycle Company. At this point there are about a dozen employees and production is three high-wheelers a week. 1889 Reynolds founds the Patented Butted Tube Company. 1895 British stockbroker Terah Hooley buys controlling interest in Raleigh. 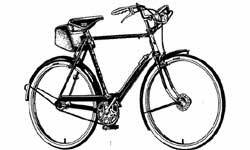 1896 Fred Hanstock builds the first Carlton bicycles in Carlton, England. 1896 Raleigh has the world's largest bicycle factory, occupying 7 1/2 acres. There are about 850 employees and production is 30,000 units per year. 1923 Patented Butted Tube Company name is changed to Reynolds Tube Company, Ltd.
1930's Carlton bicycle factory moves to larger facilities in Worksop, England. 1932 Raleigh buys Humber Cycles. 1935 Reynolds 531 manganese-molybdenum ("mang-moly") tubing is developed. 1938 Raleighs first exported to Canada. 1953 Raleigh buys the Triumph Cycle Company. 1957 Raleigh buys BSA (Birmingham Small Arms). 1960 Raleigh and the Tube Investments Group (aka TI) merge, forming TI Raleigh. 1960 Raleigh purchases the Carlton bicycle factory in Worksop. Production of all handbuilt, Reynolds 531 frames are moved to Worksop. 1972 Raleigh opens factory in Waterloo, Quebec, Canada. 1974 TI Raleigh completes its Ilkeston factory. Specialty bicycle section (handbuilt one-of-a-kind frames) is moved from Worksop to Ilkeston. 1975 Reynolds 753 tubing is introduced. 1977 Reynolds Tube Company, Ltd. name is changed to TI Reynolds to reflect the growing diversity of the company's products. 1979 Production of Raleigh 531DB-tubed bicycles reaches 10,000 units a year. 1982 Rights to the Raleigh U.S.A. name are bought by the Huffy Corporation. Better models from the Huffy era were made in Japan. No more British-made Raleighs will be imported to the U.S. from this time forward. 1984 Aboard Raleigh-badged bicycles, Team U.S.A. scores impressive victories at the Olympic Games. This marks the introduction of "funny" bikes. 1986 Huffy deal expires, Raleigh USA division of Tube Investments. 1987 Derby International Corporation, a multinational conglomerate, buys Raleigh from Tube Investments. 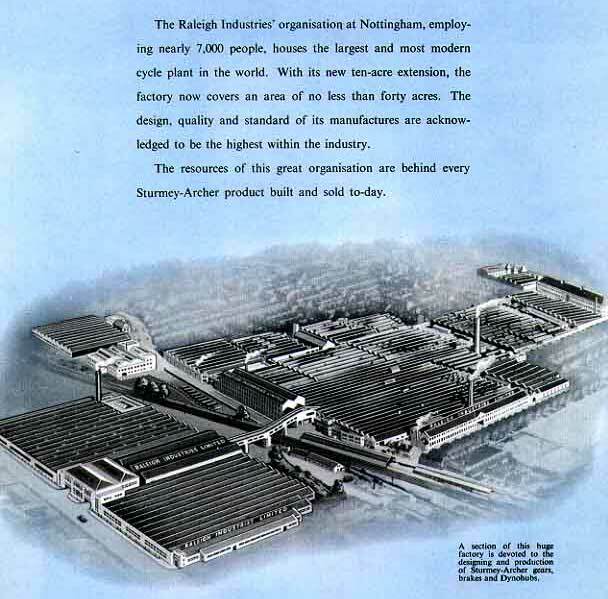 The Nottingham Works in 1952, from the 50th anniversary Sturmey-Archer booklet. This factory was torn down in 2002.